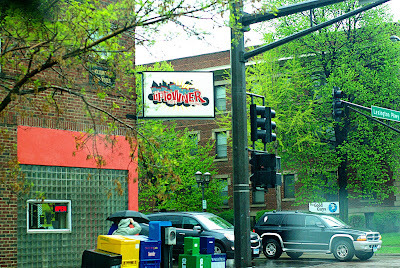 We hadn't planned to go to the Uptowner on Grand. The Big D wanted to go to Keys because I think it is his favorite greasy breakfast joint and we were seeking something that is on route to our credit union. That place is always incredibly busy and should only be attempted before 9:00. We didn't arrive until 10:30. It was way too crazy busy to wait for a table on a rainy day, in the chilly, drippy entrance way, holding a heavy infant car seat with infant in it. We left and got back on the road and I somewhat despaired, wanting, needing coffee (decaf - yes, even though it was decaf, I needed it!) and food. I have been with this particular credit union for over 17 years. They gave me my first auto loan. It has switched locations a half a dozen times in these last 17 years, but they are so great that I am willing to follow them around. I only make it to the credit union every couple of months and every time we go, it seems like a day trip. Today being Saturday, we were under the pressure to get there by noon. Just as I was reaching my moment of total desperation we hit the corner of Lexington and Grand. 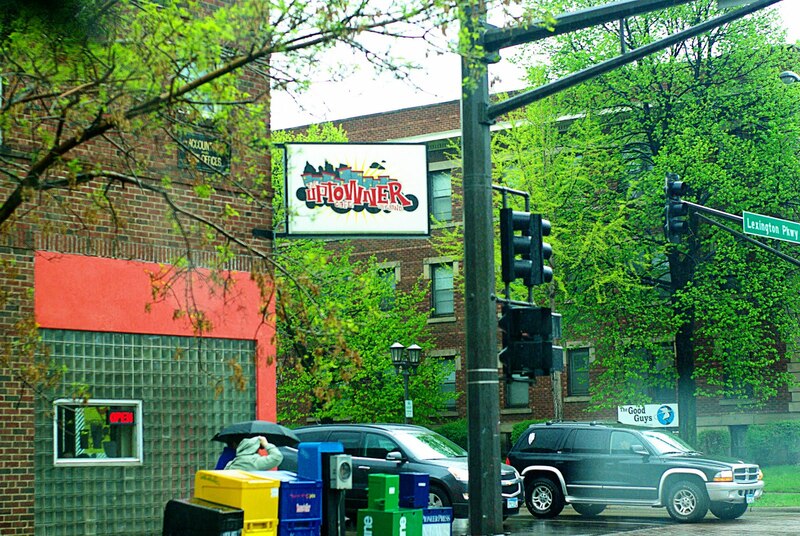 And thank the gods, there was the Uptowner. Now, I gotta tell ya, I vaguely remember hearing that Obama had stopped into this place when he was in town. So, I thought: If it's good enough for the President, it should be good enough for us. We circled around, found a parking spot and marched our way into the joint. I was ecstatic, the hunger making me a little loopy. I virtually leaped in through the door. Then, jerked to a halt when I discovered how incredibly small it was in there. There was maybe 5 booths, another 5-6 tables and about 8 stools. OK. So maybe this wasn't where the President of these here United States stopped by for breakfast. And, do they even have a place for us? 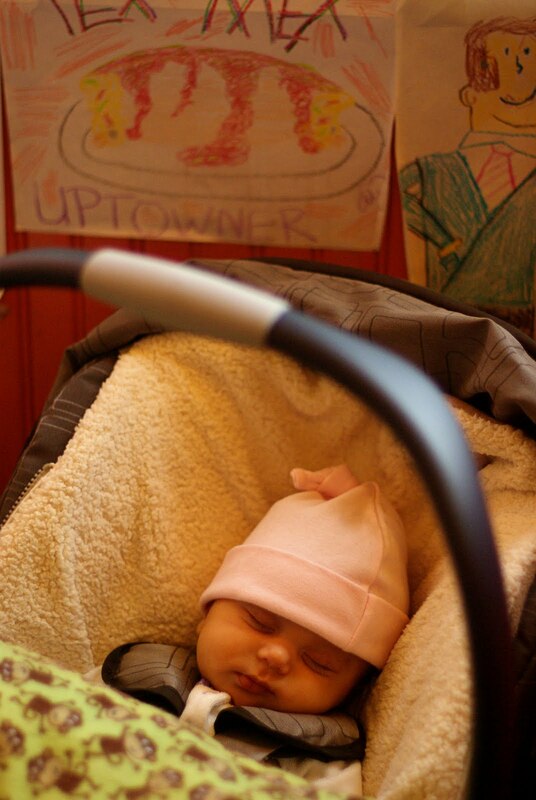 And, more importantly, would the Baby Lotus Bud stay sleeping in this noisy, lively diner? But, the awesome thing about bringing Baby out with us is that everyone is really nice and accommodating. They found us a booth and an unobstructed view of the behind-the-counter kitchen. We saw the hash browns being buttered, the poached eggs boiling over, and the bacon sizzling to perfection. I cringed every time that the cook whacked his spatula against the stove with ear-splitting rings thinking that would awaken Baby Lotus Bud. Yet, it seemed each bang rang like a gong that sent her into deeper levels of sleep. She did great. See that drawing behind Baby Lotus Bud? Those drawings were everywhere, I mean on all over the walls. Some the work of children, others spontaneous works of art, all, for sure, full of love and effort. It was fun looking at all the drawings and it was a great distraction while we waited for our food because they were busy. There was never an empty table or counter stool the entire time we were there (but also, there weren't very many to begin with, plus a line out the door). I wanted to take pictures of the cook, the long stove (the kind that's flat, I don't know what to call it), the busyness of this tiny place, but I was too shy. I was skeptical about the food, it was the hunger that made me skeptical. The Big D kept saying this could end being the best dang breakfast ever. As it turns out, it was! Well, for him. I just ordered the regular old over-medium eggs, which, don't get me wrong, were good - in fact, they were cooked to perfection. But, this did not compare to the Big D's Uptowner Benedict. It had tomatoes in it's layers of sausage and egg goodness. For some reason, that bite with the tomato was absolutely wonderful adding just the perfect taste of sweetness. The sausage was Cajun-spicy - spicy like he likes it and he likes it spicy. As it turns out, I couldn't confirm whether or not the President stopped in there during one of his trips to the Twin Cities. But if he did, I'm sure he enjoyed it as much as we did. It was the kind of place where as people were leaving they scooted quickly behind the counter and thanked the cook for creating such delicious food. What a great way to start the weekend! I tell ya - I love living in this state! We are on the look out for a new breakfast place too since Blackbird burned down. Its harder to find then you would think around here. My biggest pet peeve is so many places have awful weak decaf coffee.